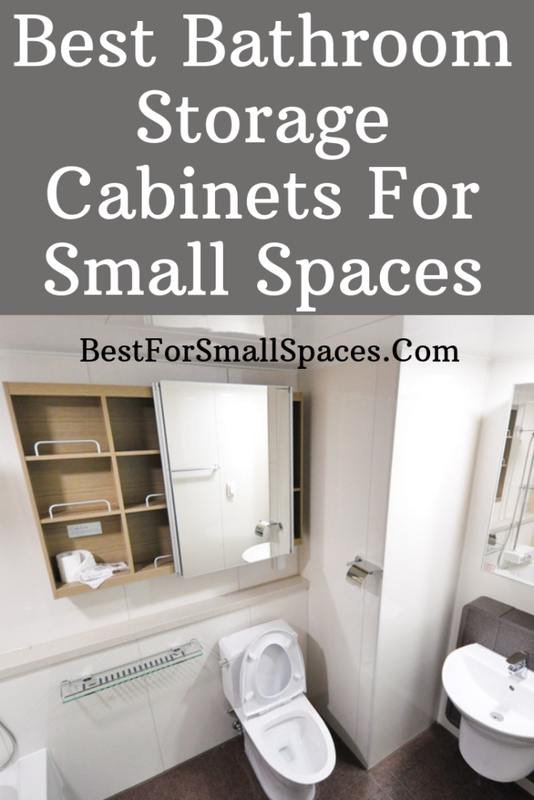 November 11, 2017 0 comments on "Best Bathroom Storage Cabinets For Small Spaces 2019"
A bathroom is usually one of the smaller rooms in a home and can be difficult to fit everything you need into one. A bath, shower, sink, cabinet, mirror, never mind towels, cloths and beauty products, all have to fit into this small space. Therefore, some careful planning, clever design and some multi purpose furniture can really make a difference when it comes to making the most of limited space. Cabinets that have other functions like mirrors and extra storage space are definitely great choices for small bathrooms. Cabinets that slot into unused areas such as behind doors, under sinks, over sinks and in corners are convenient, great options for small bathrooms and real space savers. In this article, ‘Best Bathroom Storage Cabinets For Small Spaces 2019’, we will be reviewing a choice of all different types of cabinets that will be perfect space savers for your small bathroom. This pretty over the toilet cabinet is a great space saver for small bathrooms. 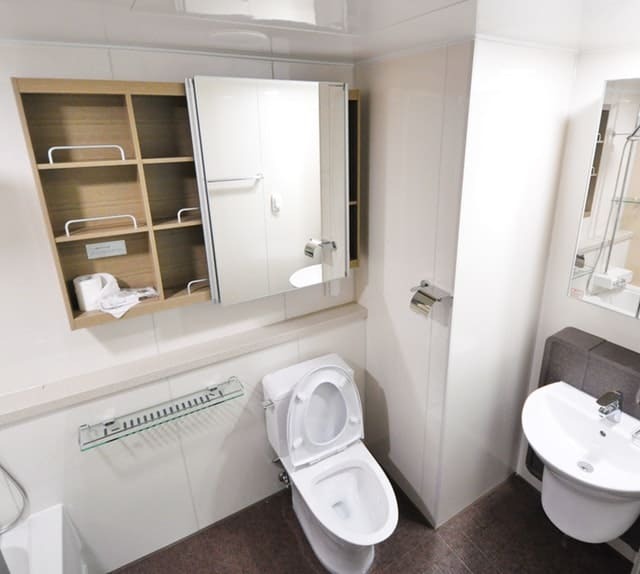 It fits nicely over any standard sized toilet and will take up no further room than the toilet area. This space saver will use the free space above the toilet to store all your small bathroom items. The product arrives relatively quickly by UPS and is well packaged in a single box, by the merchant. The item weighs 40 lbs. This bathroom cabinet will require assembly, however the instructions are detailed and very clear. The instructions include images, making it very easy to follow. There are many steps involved in the assembly of this cabinet, however they are not complicated. Once assembled, the cabinet is surprisingly strong and sturdy. It is a self standing cabinet, therefore no mounting is needed. One issue some customers had was that the bottom bar is only 6” off the floor and was too low for some toilets because the water pipe was higher than 6”. A minor adjustment was needed to place the bar up a little higher. It is a pretty piece of furniture, with strong and sturdy wood construction. We really like the decorative scrolling and the curtained windows are a nice touch. It has one inner shelf that is adjustable if you want to put taller items in the cabinet. It also has one open cubby underneath the cabinet for easy access items. Overall measurements are 8” x 24” x 67”. 67” isn’t a bad height for easy reach and 24” width gives plenty of room for medicine and vanity items. Overall, this Cabinet by Elegant Home Fashions is a great looking, strong and sturdy piece of furniture, that will look great in most bathrooms. Its positioning over the toilet is a great space saving solution and makes great use of this free area. This bathroom storage cabinet by Target Marketing is made of bamboo with a natural finish. This space saver not only looks great but is a perfect for small bathrooms by adding extra storage in the free space above the toilet tank. Shipping box and contents are well packaged. The box weighs 36 pounds. Instructions are very detailed and easy to follow. The cabinet does not need to be mounted. It is sturdy, stable and fits nicely over a standard size toilet. All pieces are marked with little removable numbered stickers, which makes assembly very straightforward. Make sure that the bottom brace clears the water supply pipe coming out of the wall. If minor adjustments are needed to move the brace up a little, then it is a lot easier to make the adjustments before the whole cabinet is assembled. We love the look of the bamboo and the natural feel this cabinet brings to a bathroom. The cabinet is made of solid bamboo and is nicely finished. The finished product is sturdy and we love the sliding door. It has a single shelf inside and an open shelf underneath. The fully assembled furniture measures 10” x 27.6” x 66.8”. A good height and width to fit all your small personal bathroom items and with 10” depth, it has some decent space. We love the look of this good value Bathroom Storage Cabinet by Target Marketing. The natural bamboo finish looks great and its solid and sturdy construction is impressive. If you want a natural feel to your small bathroom, then this space saver is definitely worth considering. This space saving bathroom cabinet by RiverRidge is simple, elegant and good value. It is strong and sturdy with extra stability wall mounting. It comes in both White and Espresso and should look great in any small bathroom. Product arrives well packaged and at a weight of 40.8 pounds. Instructions are well detailed and assembly is quite easy. Once more, for this type of cabinet, you should check to see if the cross brace will fit over the water supply valve. Minor adjustments will be needed if it doesn’t quite fit, and these adjustments will be a lot easier before the cabinet is fully assembled. This space saving cabinet, unlike the other over the toilet reviews has the option of anchoring the cabinet to the wall, for added stability. We recommend you mount it to the wall because it has pull open doors and when you pull open the doors, the cabinet may wobble. The wall mounting is not difficult. It is a sturdy bathroom cabinet, that is both simple in design but also attractive. It has ample space with one shelf inside the cabinet and one open shelf underneath. The overall measurements of the assembled cabinet are 9.25” L x 27.36” W x 63.75” H, allowing decent space for medicine and other small bathroom items. Overall, this is a nice, solid bathroom cabinet and we love the the espresso color finish. It is simple but stylish and would be great for a small bathroom. We also really like the wall mounting feature as it adds a little more stability to the cabinet. Overall, this Space Saving Cabinet by RiverRidge is both good value and ideal for small bathrooms. This classy looking, single door bathroom cabinet is a bestseller on Amazon and it is easy to see why. The mirrors on the inside and outside of the cabinet give a clean look to it and it is a very nice size for fitting all your small bathroom items all in one place. All parts are well packaged because there are a number of glass shelves. When unpacking be careful when removing the parts because they can easily slip out of the packaging and smash on the floor. The cabinet requires very little assembly. With what needs to be assembled, a manual is accompanied with clear instructions. With this cabinet you have the choice of either in wall mounting or surface mounting. For surface mounting, there is a track at the bottom of the cabinet and mounts on the top. If you choose to surface mount this cabinet, it also comes with mirrored side panels. This cabinet is clean, contemporary and looks high quality for the price. We really like the mirrored style and the glass shelves are a nice touch also. The mirrored interior is another positive feature. The assembled cabinet measures 20”W x 26”H x 5”D. The two inner glass shelves are adjustable for taller item storage. It is large enough to store all your smaller bathroom items, yet will not take up too much space in your small bathroom. We really like the look of this medicine cabinet and understand why it is a Bestseller on Amazon. It is not only great value but looks higher quality than its price. The cabinet and mirror combination is perfect as a space saving solution for small bathrooms. This elegant, mirrored, white medicine cabinet by Elegant Home Fashions is not only a budget cabinet but also looks great. It is small, pretty and will not take up too much space in a small bathroom. Well packaged and a light weight of 19.3 pounds. The whole cabinet needs to be assembled. There are many different pieces to assemble but it is quite simple and shouldn’t take too long. It is a surface mount style cabinet and cannot be in wall mounted. There are two notched out hangers at the back and comes with anchors and screws. Its a very nice looking cabinet that has a pure white finish. The mirror on the door is a handy feature and will especially be helpful as an over the bathroom sink cabinet. The door can be assembled to open from the left or the right. With its sturdy wood construction and a pretty crystal knob, this little cabinet looks great and is very functional. The assembled cabinet measures 6.5” by 20” by 24”. It is a small cabinet but has more than enough space for all bathroom essentials and medicine. Inside the cabinet there is an adjustable shelf, in case you want to place taller items inside. The mirror is 12.75” by 12.75” and the cubbies measure 5.5” H by 5” W by 5” D.
This is a very pretty little cabinet and as one of the cheaper options, it is definitely a bargain buy. The mirror on the door is a nice feature and although the cabinet is quite small, there is more than enough storage space for medicine and bathroom products. A Bargain, Pretty Cabinet by Elegant Home Fashions, ideal for small bathrooms. Another classy, contemporary cabinet by Kohler. Mirrored interior, two adjustable glass shelves and an arch shaped mirrored door makes this medicine cabinet a real beauty. The mirrored door is larger than the cabinet itself, providing a larger vanity mirror for your small bathroom. Shipped from and sold by Amazon, the package is certified by Amazon as Frustration Free Packaging. It basically means Amazon have put extra care in their packaging and your cabinet will arrive all in one piece and will also be easier to open. Item weighs 29 pounds. It may take two people to assemble the cabinet and mount it to the wall. It is not difficult to assemble, however more than two hands may be needed to hold parts in place while assembling. Can be surface mounted or recess mounted, depending on your preference. The hardware for mounting is all provided. Side mirror kit is included for surface mount installation. This cabinet is very stylish looking and we love the beveled edges. The mirror shape looks wonderful and is plenty large enough as a bathroom mirror. When opened the interior looks great with the back mirror and the adjustable glass shelves. Overall assembled dimensions are 20” W by 31” H by 5” D. This is a sizable cabinet and has lots of interior space for bathroom items. The glass shelves are adjustable for taller items. A nice feature is that the door opens 108 degrees for easy access. We love the look of this medicine cabinet and believe it would be ideal for any small bathroom. The mirrors are great for space saving and there is ample interior storage space for medicine and beauty products. This indeed, is a very impressive looking Bathroom Cabinet by Kohler. Simple, sturdy, wooden constructed medicine cabinet by Elegant Home Fashions. Waffle pattern glass doors open out to reveal two shelves inside. The wall cabinet has a nice espresso finish. A good value, square designed cabinet. Packaged well and quick delivery. Cabinet weighs 27 pounds. Comes with very straight forward instructions and is very easy to assemble. Most of the assembly can be done without instructions. The inner shelves are fixed and cannot be adjusted in height. Two holes at the rear of the cabinet for mounting (screws are supplied). These screw go through the cabinet and on to the wall stud. A basic square design, however the glass does add some style to the cabinet. We really like the deep espresso color. It looks a sturdy cabinet also. One thing to note is that items on the shelves will be noticeable through the patterned glass (the shapes of the items can be seen through the glass). The assembled cabinet measures 22.2” W x 8” D x 25” H. The interior of the cabinet measures 19.75” W x 5.75” D x 24.25” H.
This bargain buy Wall Cabinet by Elegant Home Fashions is good value and has a simple but nice design. The color is great and the glass doors are a nice touch. It has decent interior storage space and would be a nice addition to a small bathroom. Many small homes have vacant narrow spaces that are left unused because nothing fits in them. This is where a rolling storage cabinet can be a great asset for storage in small bathrooms. The bathroom organizer can roll into a narrow spot and with two pull out drawers, will be great for storing small bathroom essentials. The package will be delivered by UPS or USPS within 3-6 business days of ordering. It is packaged well but if any problems occur in transit, the company is good for replacements. The cabinet comes fully assembled, except for the caster wheels. If you want to be able to roll the cabinet in and out, just attach the four wheels and it is good to go. Made of medium density fiberboard, this cute little rolling cabinet not only looks great but is very versatile. The pullout drawers are very convenient and we love the two top straw baskets. The overall dimensions of the cabinet are 19.6” L x 6.3” W x 28.7” H. The basket sizes are 8.8” L x 6.3” W x 3.5” H.
We really love the concept of this Rolling, Floor Cabinet by Tangkula and believe it is a great space saver for small bathrooms. The small drawer is perfect for beauty products and other smaller items. The bottom drawer is deeper and is ideal for larger items like towels. The two cute little baskets are great for extra storage of small items. This versatile and mobile, narrow cabinet is the perfect choice for space savers that want to get the most out of every available space in their small bathroom. What a fantastic storage cabinet this is. There are three types to choose from: regular back, chalkboard back or mirrored back. We will be reviewing the mirrored back. Many small space owners use the back of doors as a place to hang towels, jackets, scarves etc. It is a unused area and should certainly be utilised. However, this cabinet takes it to another level. Attached to the hinges of the door, this large cabinet can be opened to reveal 10 shelves, and closed to reveal a full length mirror. This is an awesome piece of furniture and ideal for small spaces. The storage cabinet arrives with excellent packaging and for the size of the cabinet, it surprisingly only weighs 33 pounds. The actual cabinet comes fully assembled, however the shelves needed to be attached and the brackets adjusted to mount the cabinet to the door hinges. Instructions are included and it is not a difficult process. There are holes for the mounting hardware down the side of the cabinet, that will be attached to the hinges of your bathroom door. Each door is not the same size, therefore the hardware needs to be adjusted to match the hinges on the door. This cabinet is made of high quality materials and finished with four coats of oil based white paint. It certainly looks fantastic, especially with the full length mirror. This storage cabinet has the storage capacity of 5 medicine cabinets and the beauty of it is, that it takes up very little space. This piece of furniture will certainly add to the appearance of your small bathroom and will definitely not go unnoticed by guests. The Cabidor Classic arrives assembled and will measure 70” H by 16” W x 4” D.
This is certainly one of our favorite cabinets in this article and for extra storage space, this one wins hands down. If you want extra shelf space and a full size mirror, then this Tall Cabinet by Cabidor is the one for you. This clever piece of furniture will be very useful in a small bathroom and is an ideal space saving dual purpose cabinet. This elegant oil-rubbed bronze framed mirror by Kohler looks great and would be a perfect match for bronze bathroom faucets. It is spacious, well built and has a lovely design. Packaged well and delivered by USPS or UPS. Item weight is 12 pounds. No assembly required unless the cabinet is going to be surface mounted. If surface mounted, then the side mirrors need to be attached. This medicine cabinet can be recess mounted or surface mounted. Mounting the cabinet is relatively easy to do and detailed instructions are provided. Mounting hardware and side mirror kit included. This cabinet has a beautiful design and we love the oil rubbed bronze finish. A silver version is available on Amazon also, however the bronze stood out for us. Like many other Kohler bathroom cabinets, this one has mirrors everywhere, with glass shelves, sturdy construction and classy design. Overall dimensions: 26” H x 20” W x 5.375” D. It is not a small medicine cabinet and is quite spacious. The glass shelves are 0.25” thick and can be adjusted to your preferred height. Kohler have a good name for making high quality bathroom furniture, therefore it is no surprise that this is a sturdy, Well Designed Bathroom Cabinet. How this cabinet may interest people more than other ones is the oil rubbed bronze finish. It is a great looking cabinet and would be a perfect match for a small bathroom that has bronzed faucets. This clever little cabinet by Flip Frame, provides the benefit of a medicine cabinet and a counter top in one. We love dual purpose furniture here at Best For Small Spaces and this cabinet definitely meets a need. Perfect for placing items on the counter while doing something else. Apply make up, check your phone, have your cup of coffee, all at hands reach on this handy counter top. Item arrives well packaged and in good time. The cabinet arrives already assembled and has a detailed manual for easy installation. The photos/paintings of your choice can be changed in seconds. This cabinet is mounted to the wall using a French cleat system. A manual with clear and precise instruction is provided and it really is easy to mount. With its solid wood frame, this multi-purpose cabinet is a space saving gem. It is strong and sturdily built with some nice storage space. The inner cabinet has three adjustable glass shelves with 10 height options. Another feature we really like is the slow close hinges. The front of the cabinet is used as a painting or photograph holder. The image can be slid in and out within seconds, when you want to change things up. There are White or Cafe Espresso colors to choose from. The overall dimensions of the cabinet are 17” W x 21” H x 5.25” D, making it a decent sized cabinet. The interior depth is 4”, allowing a lot of space for storage of beauty products and medicine inside. Mat opening standard measurement is 11” x 14” and without Mat opening is 12.5” x 16.5”. This versatile cabinet not only looks great but is also really functional and a wonderful space saver for not only small bathrooms but also small kitchens, small bedrooms and small living rooms. This cabinet can easily fit into any room and look fantastic. When this product was first released, it created a lot of buzz and it is still very popular today. We highly recommend this Space Saving Cabinet by Flip Frame for small bathrooms. Have you a corner space that is free for a storage cabinet? Then this little cabinet would be ideal for your small bathroom or bedroom. This attractive piece of furniture will fit snug into a corner, offer great storage capacity and also a place to put a picture, a plant or a mirror on top. No problems with packaging and arrives in reasonable time. A breeze to assemble. Specially designed hardware package for easy assembly. No wall mounting needed. Place in a corner and use. A great value, attractive piece of furniture, that has a surprising amount of space for storage. Fits nicely into a corner of a bathroom or bedroom. Can hold several towels and facecloths and other items. We love the simple, solid design and the chrome door knobs are a nice touch. The assembled cabinet measures 32” H x 15” W . From the back corner to the edge is 17.75”, which may be too large for some rooms. Measure the area you imagine you will place this cabinet to see if it will be the correct fit for your small room. Overall, this Corner Storage Cabinet by Bayfield looks great and is also very good value for the price. Suitable for bathrooms or bedrooms, the cabinet provides good storage capacity for towels etc. This under the sink vanity cabinet by Evideco, is another option for getting the most storage space out of a small bathroom. If there is free space underneath your sink, then this slot in cabinet could fit perfectly and offer extra storage opportunities. Shipped from and sold by Amazon, therefore packaging should be of high standard and delivery times should be quick. Very easy to assemble and all that is needed is a Phillips screwdriver. This under sink cabinet is not mounted to a wall but slots under a wall mounted sink. It is not suitable for pedestal sinks. Basic but nice looking cabinets. They have one non-adjustable shelf inside and offer good storage capacity. The upper back area of the cabinet is backless, therefore there is no need to worry about not being able to get at any wall fittings when the cabinet is in place. Overall dimensions are 23.6″H X 23.6″W X 11.8″D, providing ample room for bathroom items. The pre-cut area on the top to allow it to slide in next to the sink is 6” x 6”. This is a nice, handy Storage Cabinet by Evideco, that will work wonders for small bathrooms with free space under the sink. It is a decent price and is a no frills cabinet. The color is a Miami White. The cabinet is only suitable for wall mounted sinks and not pedestal sinks. Similar in design to the Cabidor mirrored storage cabinet reviewed above, this long cabinet with full length mirror door can be hung on the back of a bathroom door. It offers great storage opportunities and will take up no extra space in your bathroom. It is packaged securely and arrives in a large box. The box dimensions are 52” x 16.2” W x 6” D and weighs roughly 25 pounds. The tool needed to assemble the cabinet is provided and it is very easy to assemble. The cabinet can either be wall mounted or hung on the back of a door. Hardware and instructions are provided for wall mounting and the hooks are also provided. The cabinet is quite heavy but the hooks are supportive and will hold the weight of the cabinet quite easily. Constructed with durable wood, this stylish cabinet has a velvet lining interior. It has a streamline design without handles. The door edge is a little wider, making it easy to open without a knob or handle. The door has a magnetic closure and the cabinet remains securely in place when opening and closing. We also really like the key lockable door feature. The overall dimensions of this cabinet are 47.25”” H x 14” W x 3.5” D. If you want to hang this cabinet over your door, then make sure that you have some space between the frame and the top of the door. The hooks are not thick so it shouldn’t be a problem. This is a great looking, Good Value Cabinet by Shelving Solutions, with solid construction. We love the versatility of the mounting and believe hanging it behind the bathroom door is a fantastic idea for space saving in small bathrooms. A fantastic value cabinet for jewelry and vanity products. Tall and narrow are the qualities that make this white cabinet a perfect fit for a small bathroom. This stylish cabinet should fit nicely into a small space and with its extra height it will give extra storage for plenty of towels. Packaged and delivered by Amazon, therefore it should be packaged well and have decent delivery times. Package weighs 50.4 pounds. Assembly instructions and hardware provided. Assembly is easy and shouldn’t take more than an hour, by one person. No wall mounting. Self standing storage cabinet. Made of sturdy medium density fiberwood, the cabinet looks strong, durable and sturdy. It is a nice looking cabinet with a pure white finish. Vintage metal knobs are a nice feature. We really like the crown molding top because it gives a more elegant look to the cabinet. Inside the cabinet is a shelf that can be adjusted for different sized storage items. Overall dimensions are 16.93″ L x 13.58″ W x 65.55″ H. The cabinet is quite tall at over 65” but narrow at just 13.58”. Ideal for slotting into narrow areas. This is a really nice looking Cabinet that will be Perfect for a Small Bathroom. The height gives extra storage space without taking up too much room. Another Kohler cabinet, another quality cabinet. This cabinet is the most expensive cabinet in this article but many customers on Amazon believe it is worth the price. This delivery will be handled completely by Amazon, therefore expect good service, packaging and delivery times. The weight of this product is 40 pounds. Detailed instructions are provided, which helps simplify assembly. The Verdera cabinet can be recess mounted or surface mounted. The surface mount can be installed by using the hanger bar provided for the wall. The cabinet should then slide securely into place on the bar with mounting clips (pretty much the same as hanging a picture frame to the wall). Side mirror kit sold separately for surface mount installation. Although it is a pricey cabinet, it is very high quality. It is spacious and sturdy and comes in different sizes. The interior is all mirror and the magnifying mirror inside, is a nice touch. Sturdy tempered glass shelves are adjustable to suit your needs. One feature we really like is the soft close door, which is very smooth. The cabinets come with a height of 30”, however you can choose different width sizes from 15” to 40”. Here are two links to the two smallest widths of 15” Width and 20” Width, which are the most suitable for smaller bathrooms. An expensive but high quality cabinet that is both beautiful and spacious. The mirror on the outside and the inside gives a stylish feel along with the tempered glass shelves. Bonus features of an inner magnifying mirror and a slow close door makes this a top of the range Kohler cabinet, that would look amazing in any small bathroom. The most effective way of maximising limited space in a small bathroom is to find areas that may be awkward or too small for regular style furniture to fit into. There is specially designed furniture that will fit into little areas or shaped to slide into awkward areas. For example, an under sink cabinet that slots under the sink drain pipe or a narrow cabinet on wheels that can slide in and out of a space as narrow as 6″. Another example is a corner cabinet can be a nice addition to a free corner. Adding a shelf or a cabinet over your sink will make the best use of this area. And finally, a cabinet connected to the back of your door is a great way of making use of this free space. Multi-purpose furniture is always a great idea when it comes to small homes. Having one piece of furniture that provides the benefits of two or more pieces of furniture is maximising limited space and should be used as much as possible. Therefore, if you can buy a multi-purpose cabinet for your small bathroom, then definitely consider it. There are cabinets with mirrors, trays or cabinets that provide extra storage on top or underneath. Finally, narrow and tall is always a good idea when choosing furniture for small rooms. A narrow and tall cabinet will take up less space on the ground and use more space up high. Shelves on the upper walls are another way of getting free storage space up high. Storage cabinets will not take up that much space in a small bathroom, however some cabinets are better space savers than others. As you can see in this article, there are many different styles of cabinets to choose from and they come in all different sizes. When choosing a cabinet (or any piece of furniture) for small spaces, dual purpose makes use of space the best. That is why a storage cabinet with a mirror is such a good idea. Storage cabinets that fit in awkward places, like over the toilet or under the sink, are another handy way of using valuable free space, most effectively. Using corner space can also be a a great way of using an under used space in a bathroom (another example are bathroom sinks designed especially for corners)and fortunately you can get cabinets suitable for corners. Recessed cabinets are another great way of taking up as little space as possible in your bathroom. Recessed furniture can take a lot more effort to mount, however they are a wonderful space saver. A bathroom can be one of the smallest rooms in a home but it doesn’t make it any less important. A good quality cabinet can last for many years and make your bathroom look a million dollars. Choosing one of these styles of cabinets can make the best use of limited space in your bathroom and squeeze extra storage opportunities out of unused areas. We hope you found the ‘Best Bathroom Cabinets For Small Spaces 2019’ helpful and were able to find the perfect cabinet for your small bathroom.